Metropolis has more than just a title in common with Fritz Lang’s 1927 early classic of science fiction. 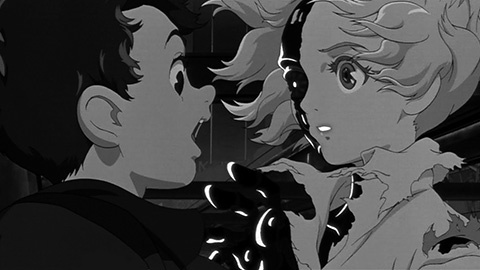 Though scripted by Akira director Katsuhiro Otomo from Osamu Tezuka’s 1949 manga of the same name, it builds upon the same conception of a futuristic city space divided into different zones and levels for its various functions, and for the classes of the inhabitants who live and work there, as Lang’s film version of Thea von Harbou’s novel: the rulers and thinkers above ground, the servers and workers below, and traffic between the various levels restricted. The retro designs of the buildings (echoed aurally in the New Orleans Dixieland jazz soundtrack composed by Toshiyuki Honda, who earlier scored a number of Juzo Itami productions), based upon the then-modern architecture of Frank Lloyd Wright (whose influence still persists upon the Tokyo skyline) owe heavily to 1920s imaginings of what the future city should look like. 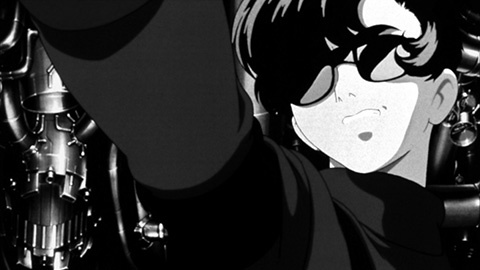 Furthermore, characters such as Dr Laughton and his robotic creation Tima clearly have their counterparts with the original’s Rotwang and Maria, though in Tezuka’s world they also prefigure the character with whom his name would later become most indelibly attached: Tetsuwan Atomu, or Astroboy. Interestingly, it was with this character’s TV animations during the 60s, as well as other Tezuka creations such as Kimba the White Lion (Janguru Taitei, 1966) at the manga artist’s animation studio Mushi Productions that director Rintaro first cut his teeth, later going on to direct works such as Galaxy Express 999 (Ginga Tetsudo 999, 1978) and X (1996). But Tezuka, Otomo and Rintaro tell a rather different story from Lang’s within these grandiose settings, one which recognises that many of the tropes and ideas throughout the history of science fiction (animated or otherwise and from whatever part of the globe) are mainly extrapolations of those from the monumental UfA film. Their version also bears some uncanny resemblances to Spielberg’s Artificial Intelligence, released in the same year. On the surface, the city backdrop of Metropolis is a perfectly functioning utopia, though its majestic façade masks tensions between the humans and the robots that keep it in operation. The human element of society is divided into two groups; those supportive of their robot servers, and those who believe they are stealing human jobs and threatening to take over the city. Towering above the city is the jewel in its crown – the newly constructed Ziggurat. During its opening ceremony, as the gathered human masses stand gasping open-mouthed at its foot, a robot inadvertently strays among the crowds into the Grand Plaza, and is immediately gunned down. The only thing left to cap the new building is a figurehead. This finishing touch takes the form of a young girl robot named Tima, commissioned from Dr Laughton by the powerful leader Duke Red and modelled on his dead daughter. Her destiny is to sit on the throne on the top of the tower. Unfortunately Laughton is so enamoured by his new creation that he is loathe to hand it over. Moreover, with more than small degree of envy involved, Duke Red’s robot-hating adopted son Rock refuses to be replaced in his father’s affections by this synthetic humanoid testament to his father’s power. Fleeing from those who seek to destroy her, the newly created Tima manages to escape into the underground labyrinth beneath the city along with Kenichi, the adolescent nephew of a detective named Shunsaku Ban who is investigating Dr Laughton’s involvement in illegal body part trading. 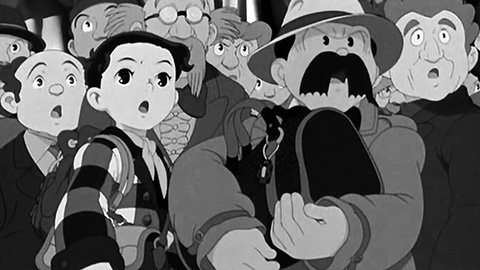 Like one of Konrad Lorenz’s imprinted goslings, Tima forges an immediate emotional connection with Kenichi, the first human being she has ever encountered, and as the two continue on their journey through the city’s lower depths, Kenichi soon begins to feel himself reciprocating this animated baby-doll’s emotional dependency. Five years and $15 million in the making, the high quality animation, consisting of some 150,000 cels embellished with a judicious use of CG puts this at the top end of the market in terms of quality. However, Metropolis was unfortunately not a resounding commercial success upon its theatrical release. Nevertheless, those unfamiliar with the highly detailed, richly meditative worlds of Japanese anime around the turn of the millennium will find this as accessible an entry point as one can hope for. 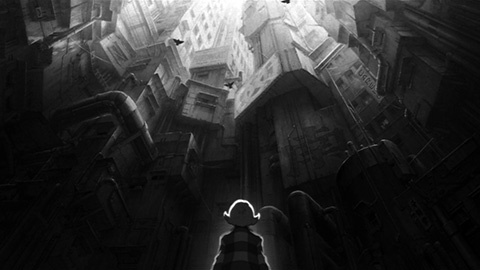 It covers many of the same ideas as other features from the period – man and robot at loggerheads with one another; mankind overreaching itself with its technology leading to mass destruction of biblical proportions (the Tower of Babel story is explicitly referenced) – but it retains an open-eyed sense of wonder missing from, say, colder works like Mamoru Oshii’s Ghost in the Shell films. 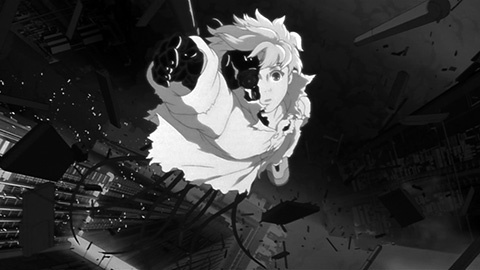 Also Otomo’s script, which successfully integrates the more intellectual elements into a story whose primary power derives from its balance of love and adventure, is far more disciplined than those of his own films, most notably that of Steamboy, which he was halfway through directing at the time. Along with his similar behind-the-scenes roles on Roujin Z (1991), Memories (1995) and Spriggan (1998), it suggests that the former manga artist plays a more useful contribution when he stays out of the director’s chair. If Metropolis suffers at all, it is due to the difficulties inherent in trying to cram Tezuka’s epic original manga story into the format of a theatrical feature film - a lot happens in Metropolis and there are a lot of characters. But overall, this is as good as Japanese animation gets, and heartily recommended.